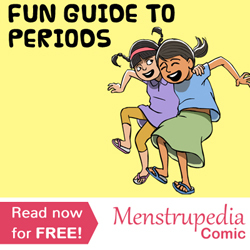 When I came across Menstrupedia and the different articles focusing upon the hush-hush topic of periods, it gave me sheer happiness, for it is heartening to know how people from different walks of life are trying their best to bring about a change in fighting taboos and by writing about a topic that has been kept under wraps since time immemorial. Here is my small write-up (please excuse my laziness) on the transformation that had taken place in me during my girlhood years. I take this opportunity to thank my school Loreto Convent, Entally, Kolkata, for providing proper guidance during the oft challenging years of adolescence. Yes, we all hated the days of strict discipline, long skirts, short nails and two ponytails and could not wait to just get away from our days of Convent education. But only with time did we realize how wrong we actually were. From values and morals to the understanding of the tabooed topic of periods – all of it were instilled in us by our facilitators in school. It was during grades 6 and 7 that we were shown special screenings organized by Procter and Gamble – Johnson and Johnson about periods. Some of us had already stepped into puberty, while others were completely ignorant of the topic at hand. With time, I have realized how lucky many of us were to get introduced to the topic beforehand and not panic on seeing blood in our pants and skirts and therefore not concluding that we were dying. We were guided in the proper manner and the screenings usually helped us understand the changes that our bodies underwent, especially by the clarification of basic concepts and questions regarding the same. The usage of sanitary napkins was also demonstrated to us. 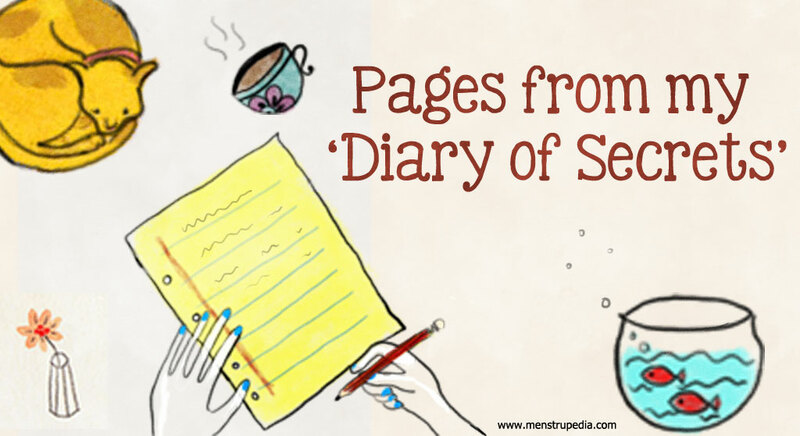 I still remember the booklet we were given, which was titled ‘My Diary of Secrets’ and contained answers to basic questions along with introductory descriptions on various issues related to periods. These questions were instrumental in breaking down the misconceptions that usually accompany periods in the initial years of puberty. Questions like, ‘Can I sit beside a boy during periods?’, and ‘Can I kiss my father or brother during those days?’ did help us understand that those days were just as normal as the other days when we were not bleeding. It was indeed immensely helpful in understanding the changes the early years of our girlhood days were filled with and helped us gracefully blossom from girls into ladies. I did not have the opportunity before this to thank Procter and Gamble – Johnson and Johnson for conducting such screenings organized in Indian schools and it is only after the passage of time that I have realized how helpful these screenings were in helping me accept the fact that I was as normal as any other woman I knew. Most importantly, even though it is after all these years, I would like to thank my school and my teachers for guiding us in the best possible way in welcoming these changes and preventing us from embracing the taboos surrounding the subject. I remember how a female friend of mine had shared a not-so-pleasant experience that she had faced during her schooling days. She was from a co-educational school, and such screenings were organized in her school as well, where only girls were allowed to view them, while boys were not permitted to do so. The next day, she tells me, she was badgered with curious questions by her male friends, and all she could come up with was an excuse about how the entire screening was about a beauty product and nothing else. I think that I would be safe to assume that many of my friends who studied in co-educational schools have certainly encountered such experiences. This illustrated how the topic was and still is being kept a secret – one that belongs only to girls, right from the early years of their schooling. I do hope however, that such screenings are still organized in different schools, for they are nevertheless very instrumental in doing away with the fear and panic that usually marks the beginning of the menstrual cycle in a girl’s life. I congratulate the Menstrupedia team for their great mission of bringing changes in the lives of not only women but in the lives of men as well. Let not menstruation chain young girls; let proper education about the topic give them new wings to fly confidently into a better tomorrow. Into a tomorrow when taboos will not be thought of – a tomorrow that will break beyond the barriers and the borders of menstrual taboos, myths and all those unhealthy practices that are related to menstruation. Sudeshna is an English major from Presidency college, Kolkata, and have completed an M.Phil in Comparative Literature from Jadavpur University, Kolkata. She loves reading, writing, painting, spending time with her loved ones and pursuing laziness as a habit.